According to the American Kennel Club's Canine Health Foundation (AKCCHF), dogs can get dementia just as people can. Once symptoms begin to show, a dog is no longer the same dog his human companions once knew. 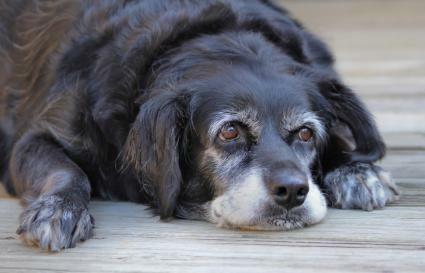 While there's no cure for dementia, early detection is key to managing your pet's condition. According to Doctors Foster and Smith, canine dementia is also referred to as Canine Cognitive Dysfunction (CCD) or Cognitive Dysfunction Syndrome (CDS), and it produces brain lesions like the lesions that Alzheimer's produces in people. Personality changes - A dog may seem more anxious and whine, pace, or circle the room frequently. Some dogs become irritable, and others may simply seem to lose interest in the world around them. Disorientation - The dog seems confused about where he is and may even get lost in his own home. Forgetfulness - As the condition progresses, the dog may no longer recognize people he has known all his life. Withdrawing - The dog spends more and more time on his own just staring into space. He gradually stops seeking attention from his human companions. Changes in sleep pattern - This includes sleeping more, especially during the day, as well as staying awake at night. Onset of house accidents - A previously trained dog may suddenly begin having house accidents, especially in inappropriate places such as his or his owner's bed. No longer responds to learned commands - The dog may no longer seem to understand what you're asking him to do, such as come when called or sit on command. He may forget other trained behaviors such as how to walk on leash or fetch a ball. A dog with dementia may only display one or two symptoms in the beginning, but he will likely develop most or all of these symptoms as his condition worsens. According to WebMD, CDS is similar to Alzheimer's disease, in that the brain of an older dog goes through changes that cause a breakdown in communication between brain cells, which reduces the animal's ability to think, recognize companions and objects, and remember how to perform learned behaviors. Gary Landsberg, DVM, BSc, as quoted by AKCCHF, goes further to say the exact cause of CDS isn't known. However, he does believe a number of causes can make neurons die off, which leads to the kind of symptoms currently associated with the syndrome. According to Dr. Joseph Mankin in an article published by Texas A&M Veterinary Medicine and Biomedical Sciences, there isn't a specific test used to diagnose dementia. The condition is mainly diagnosed by taking inventory of a dog's symptoms and performing routine blood work and other tests to look for diseases which cause the same types of symptoms. If common diseases can be ruled out, an examination by a veterinary neurologist may be in order since an MRI could reveal changes in the brain. Dementia is an incurable, progressive condition, and there is no absolute way to prevent it. According to the Australian Veterinary Association, treating CCD involves managing the symptoms in order to improve an affected dog's quality of life. Nicergoline - This medication is known as an alpha adrenergic antagonist. It's commonly used to treat humans, but it has also been recommended for dogs. It's used to prevent/treat cerebrovascular disorders and arteriosclerotic diseases. Selegeline hydrochloride, aka Anipryl - This reversible monoamine oxidase-B inhibitor is used to control anxiety and other symptoms of CCD. Propentofylline - This medication is used to combat memory loss caused by the buildup of beta-amyloid protein deposits in the brain. It's also believed to improve a dog's learning ability. Hawthorne Lodge Veterinary Practice also recommends feeding a diet that's high in antioxidants in order to reduce oxidative damage, as well as reduce the symptoms associated with dementia. In addition to the treatments mentioned above, there are other measures owners can take to manage their pets' condition. Doctors Foster and Smith make the following recommendations. Reduce clutter in the home and keep furniture arranged the same way. Stick to a regular schedule for feeding and watering. Establish regular times for walking. Provide mental stimulation with short, gentle play sessions. Keep commands simple and be patient. Caring for a dog that has dementia can be difficult and emotionally draining, but owners don't have to go through this situation alone. If you suspect your dog may be showing signs of dementia, schedule an exam with your veterinarian, and rely on him to make treatment recommendations that can help you provide your pet with the highest quality of life for as long as possible.